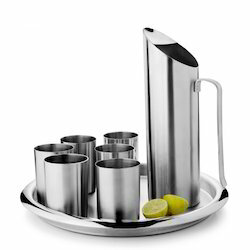 Pioneers in the industry, we offer steel jug with copper lemon set, crystal glass lemon set, stainless steel coloured lemon set, stainless steel & copper lemon set and lemon set from India. 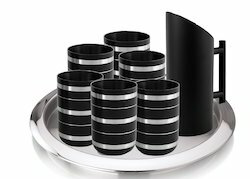 Scroll conveniently to find different designs, shapes, sizes and materials that will leave you wanting for more. Each piece is durable and made from premium quality to suit your need. King International crystal-clear glass is the most durable, most beautifully designed and best-manufactured glassware on the market. 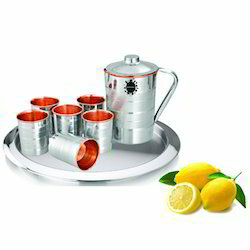 King International presents designer Lemon Set with an attractive Jug, Tray and Glasses. 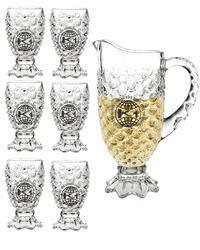 The set is available in different designs of glass, jugs and tray. It can be customized as per your requirement.